It was not how it was supposed to be. But for writing The Satanic Verses Salman Rushdie was sentenced to death by people who had no jurisdiction over him and had not read his book. This was endorsed by many people who were not able to read. His book was not the point. Rushdie was a pawn in a geo-political game, in which the politicians of Muslim indignation considered Islam to be insulted, and wanted to impose their rulings on everybody else. It took nine years before he was considered safe enough to get out of hiding. The threat did not really go away till 2002, another four years. Joseph Anton is the story of those years of survival mostly in isolation and extreme insecurity. Rushdie starts by giving his background, how he became a writer and how he developed the ideas for his books. The story of the fatwa begins with Ayatollah Khomeini’s pronouncement of 14 February 1989. Rushdie went into hiding in his own country, the UK. In its streets extremist called for him to be murdered. Politicians wavered. Somehow, many in the media considered it the death threat the result of provocation by him, even of his character. So Rushdie defended his book. It did not work. After a year or so, in 1990 he was tricked into a “reconciliation” with Islam. He regretted it nearly as soon as he had done so – Rushdie is not a religious person – and it did not bring him the promised benefit of withdrawal of the fatwa. Rushdie shows how his defence evolved. It went from the freedom of literature – “the world of books” in Rushdie-speak – towards freedom of speech in general, and increasingly, simply liberty. Rushdie does mention Hindu fundamentalism, does not mention, though, Christian fundamentalism. His struggle was with some defenders of “Islam”. Thus, in the sphere of ideas, the conflict became straight jacked in the so- called clash of civilizations. At that level it was unsolvable. “Islam” cannot be insulted or appeased, people can. But Rushdie had to live on. How can one survive nine years of isolation, and even manage to co-parent one’s child, have a love life, face the cancer of one’s first wife? Rushdie records everything. We even get illnesses and deaths of his friends and supporters. 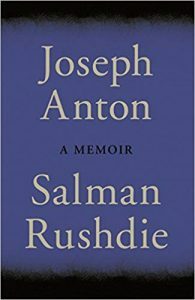 Not unique things that people face, but Salman Rushdie had to come to terms with these under appalling circumstances. The incidents show a world much shrunk. His main prop was that he was a family man. He promised his eldest son to write a book for him. Even then it took him some time to realise that this was the way to neutralize the fatwa, to continue, indeed re-start, writing. Rushdie describes this realisation in detail. He came up for fresh air during his visits to the USA. It is also here that the book loses some of its steam. In the USA Rushdie was lionised by the cultural elite. One gets names of celebrities, but they add little to the developing story. Except in one field, and that was where their input mattered most. The fatwa was a geo-political move; it was stopped by geo-political pressure exercised mainly by the UK and USA. In September 1998 the fatwa was put on hold by the Iranian government. Its effects, and the threat to Rushdie’s life, were still felt much till, roughly, 2002. By then, Muslim fundamentalists had other problems, being put on the defensive in the aftermath of 9/11 2001. We are used to the Salman Rushdie as the master of magical realism, fertile imagination and unbelievably nimble sentences. But he had arrived in such an absurd place that to describe it sober language sufficed. He expresses the alienation that he felt by using throughout the third person for himself. Rushdie describes his behaviour during these years and explains his motives . It is an autobiography, though, and, curiously given Rushdie’s interest in renaissance Florence, one is reminded of the sculptor Benvenuto Cellini’s 1558 attempt. In his determination to practise his art, Rushdie, like Cellini, is a towering figure both in his personal life and in his account of it. Other people fill the space only when the author/subject is not there – which does not happen often in an autobiography. This is not to imply that Salman Rushdie is not grateful to the people who in various ways kept him alive. He is, profusely so, but the book is about him – and his art. It is a great book in the first, and a good memoir in the second half. Joseph Anton illuminates a decisive moment of our times, the return of religious fundamentalism on the world stage after a long absence. Individuals were crushed, lives were taken. But Salman Rushdie is still here. Luckily, we can expect more books from that great enchanter.